Brian stared down at his great grandfather’s trilby hat, running his fingers around the dark felt rim. ‘It’s okay if he takes it. He’s a good boy,’ Judy said gently from across the room, pausing her ironing to look over at her husband. Brian sighed and nodded. Billy was a good boy. 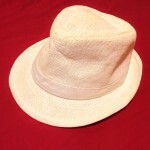 But this hat meant so much to the Allen family. ‘I know. Just, if something was to happen to this hat…’ Brian drifted away, once again lost in his thoughts; thoughts of loss and grief, so many years ago. Judy walked over and sat next to him on the edge of the bed. This time Brian sighed without nodding. He wasn’t sure if he agreed. He was so young. Before they could talk more, Billy came bounding into the room. Brian glanced at Judy before looking back towards Billy. Judy shot Brian a worried look. The next day, Brian arrived early to collect Billy from his parents’ house in Turner. Robert, Billy’s father, was waiting as Brian walked up the stairs towards their front door. ‘What have you got in store for him Dad? Same thing you did for me at his age?’ he asked. Billy was not yet in sight. ‘Yeah, something similar. Maybe he’ll get the answer right,’ Brian grinned, nudging his son in the ribs. Robert smiled briefly, before growing serious once more. ‘It taught you plenty,’ Brian replied, meeting his son’s eyes and serious look. He looked at his father for a moment longer, before turning his head inside. A moment later, Billy appeared, a big grin on his face. ‘Story day!’ he yelled, grabbing Brian’s hand. ‘Take care of him, Dad,’ Robert called as the two disappeared quickly down the stairs. ‘Where are we first going on our story trip Grandad?’ Billy asked when they hopped into the car. ‘Got it,’ Billy replied enthusiastically. Shortly afterwards, Grandad stopped the car outside a small building. ‘What’s this place Grandad?’ Billy asked. ‘What does it look like?’ Grandad asked gently, getting out of the car. 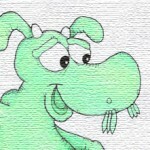 Billy followed him and stood quietly looking at the structure before him. ‘Yeah,’ Billy said hesitantly. ‘I know there were two big wars…’ he trailed off before stopping. Brian put his arm around him. ‘Can I look more closely?’ he asked. ‘Yes, you can,’ Brian answered softly. Billy walked underneath the wooden roof that provided some shelter to the otherwise open Chapel. Brian had been here many times, but despite that, and the relatively simple nature of the Chapel, he still found it a sombre place. Billy stood leaning slightly on the green gate in front of the Chapel, before again turning to his Grandad. ‘Okay, I’m ready for the next stop,’ he said quietly. His earlier enthusiasm already seemed to have drained out of him. ‘You sure?’ Brian asked, not knowing exactly what he would do if his Grandson wanted to end things now. ‘Yep, I’m sure,’ he replied. The two quietly made their way back to the car, and Brian drove the short distance to the next stop. The first stop was a brief one, and they didn’t even get a chance to get out of the car. Brian pulled up in front of a tall metal fence, behind which Billy could barely make out some buildings. ‘And they made The Simpsons,’ Billy said, smiling. As they drove, Brian continued his story. ‘But this next stop wasn’t around when I did that tour,’ Brian replied, bringing the car to stop. Billy followed Brian out of the car. Brian paused on a grassy knoll between two structures. Brian turned to his right, watching Billy’s eyes follow his gaze. Again, after some minutes of reflection, the two were again the car. Billy hadn’t wanted to look at the memorials up close, preferring to stare at them from a distance. Brian wondered if this was all too much for him after all. They seemed to be spending more time in the car than looking at the memorials. He parked the car further up Wendouree Drive and led Billy up a flight of stairs. The two walked past a number of memorials on their way up to War Memorial, pausing briefly at several including the Australian Army National Memorial, Royal Australian Air Force Memorial and Australian Service Nurses National Memorial. Brian paused for some time in particular at the Australian Vietnam Forces National Memorial. As they entered the War Memorial building, Brian knelt down next to Billy and looked him in the eye. ‘That’s when they play the trumpet?’ Billy asked. ‘Wow,’ said Billy, looking impressed. ‘But you’ve seen a lot already today, and there is something in particular I want to show you,’ Brian said, taking his grandson’s hand and leading him into a darkened room. The room was very quiet, and Brian felt Billy squeeze his hand a little tighter. ‘This room reminds me of Changi Chapel,’ Billy said. Brian considered this for a moment. With his free hand, Brian gestured to a large painting on the wall, lit by spotlights in the otherwise almost completely dark room. 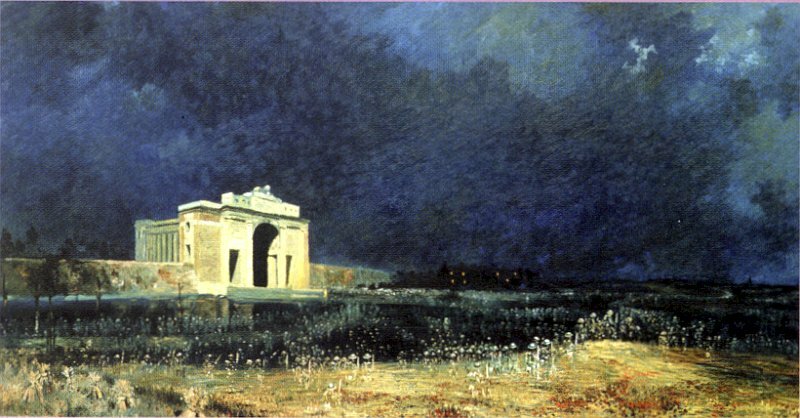 The paining depicted a large white gate in the background, with a large field of poppies in the foreground. 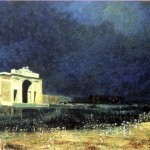 A dark and foreboding sky completed the deeply sombre nature of the painting. ‘Those flowers look like ghosts, Grandad,’ Billy said quietly. ‘But we didn’t remember Billy, not well enough. And 20 years later, the world was at war again, and William’s son Patrick was killed in Africa. But he too had a son before he died, and his name was Jack. Jack was my father. Jack fought in a war too, but he survived, and he died just before you were born. Billy stared silently up at the painting for many minutes, still holding Brian’s hand. At last he spoke. ‘I know what today is about Grandad,’ Billy whispered. ‘What’s that Billy?’ Brian said quietly, kneeling down to hear his words. The boy paused before answering, looking up into his grandfather’s weathered face. Brian tried to smile, but he was also aware of the small tear slowing down his cheek. He brushed it away. He took a deep breath before hugging his grandson. Billy smiled up at Brian. The two travelled silently back to Billy’s house. As they again began to walk up the stairs towards Billy’s front door, Brian put his arm around Billy. Billy looked up at him. Glad you liked it Cam. And yeah, I’m with you, a sombre and thought-provoking piece of art!